This article describes some common Azure deployment errors, and provides information to resolve the errors. 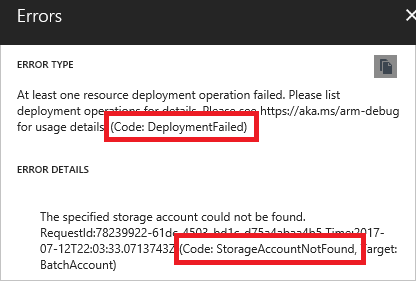 If you can't find the error code for your deployment error, see Find error code. AnotherOperationInProgress Wait for concurrent operation to complete. AuthorizationFailed Your account or service principal doesn't have sufficient access to complete the deployment. Check the role your account belongs to, and its access for the deployment scope. Conflict You're requesting an operation that isn't allowed in the resource's current state. For example, disk resizing is allowed only when creating a VM or when the VM is deallocated. DeploymentActive Wait for concurrent deployment to this resource group to complete. 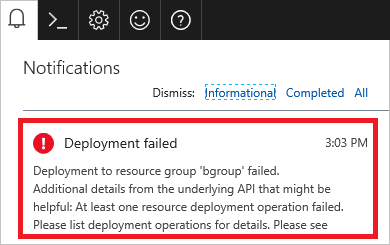 DeploymentQuotaExceeded If you reach the limit of 800 deployments per resource group, delete deployments from the history that are no longer needed. You can delete entries from the history with az group deployment delete for Azure CLI, or Remove-AzResourceGroupDeployment in PowerShell. 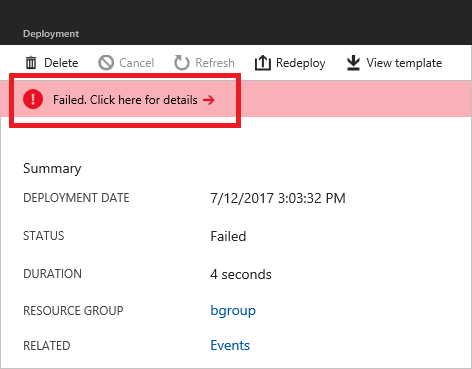 Deleting an entry from the deployment history doesn't affect the deploy resources. DnsRecordInUse The DNS record name must be unique. Either provide a different name, or modify the existing record. ImageNotFound Check VM image settings. InvalidAuthenticationTokenTenant Get access token for the appropriate tenant. You can only get the token from the tenant that your account belongs to. InvalidParameter One of the values you provided for a resource doesn't match the expected value. This error can result from many different conditions. For example, a password may be insufficient, or a blob name may be incorrect. Check the error message to determine which value needs to be corrected. LinkedAuthorizationFailed Check if your account belongs to the same tenant as the resource group you're deploying to. LinkedInvalidPropertyId The resource ID for a resource isn't resolving correctly. Check that you provide all required values for the resource ID, including subscription ID, resource group name, resource type, parent resource name (if needed), and resource name. PasswordTooLong You may have selected a password with too many characters, or may have converted your password value to a secure string before passing it as a parameter. If the template includes a secure string parameter, you don't need to convert the value to a secure string. Provide the password value as text. ResourceGroupBeingDeleted Wait for deletion to complete. StorageAccountNotFound Check the subscription, resource group, and name of the storage account you're trying to use. Validation errors arise from scenarios that can be determined before deployment. They include syntax errors in your template, or trying to deploy resources that would exceed your subscription quotas. Deployment errors arise from conditions that occur during the deployment process. They include trying to access a resource that is being deployed in parallel. Both types of errors return an error code that you use to troubleshoot the deployment. Both types of errors appear in the activity log. However, validation errors don't appear in your deployment history because the deployment never started. When deploying through the portal, you see a validation error after submitting your values. Select the message for more details. In the following image, you see an InvalidTemplateDeployment error and a message that indicates a policy blocked deployment. When the operation passes validation, but fails during deployment, you get a deployment error. az group deployment operation list --name exampledeployment -g examplegroup --query "[*].properties.statusMessage"
In the portal, select the notification. You see more details about the deployment. Select the option to find more information about the error. You see the error message and error codes. Notice there are two error codes. The first error code (DeploymentFailed) is a general error that doesn't provide the details you need to solve the error. The second error code (StorageAccountNotFound) provides the details you need. Sometimes you need more information about the request and response to learn what went wrong. During deployment, you can request that additional information is logged during a deployment. In PowerShell, set the DeploymentDebugLogLevel parameter to All, ResponseContent, or RequestContent. This information can help you determine whether a value in the template is being incorrectly set. Currently, Azure CLI doesn't support turning on debug logging, but you can retrieve debug logging. To log debug information for a nested template, use the debugSetting element. In some cases, the easiest way to troubleshoot your template is to test parts of it. You can create a simplified template that enables you to focus on the part that you believe is causing the error. For example, suppose you're receiving an error when referencing a resource. Rather than dealing with an entire template, create a template that returns the part that may be causing your problem. It can help you determine whether you're passing in the right parameters, using template functions correctly, and getting the resource you expect. Or, suppose you are encountering deployment errors that you believe are related to incorrectly set dependencies. Test your template by breaking it into simplified templates. First, create a template that deploys only a single resource (like a SQL Server). When you are sure you have that resource correctly defined, add a resource that depends on it (like a SQL Database). When you have those two resources correctly defined, add other dependent resources (like auditing policies). In between each test deployment, delete the resource group to make sure you adequately testing the dependencies. To learn about auditing actions, see Audit operations with Resource Manager. 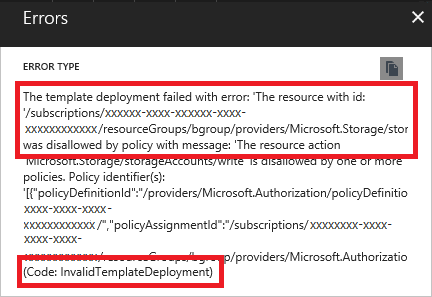 To learn about actions to determine the errors during deployment, see View deployment operations.